HOW HAS THIS HELPED YOUR BOTTOM LINE? People now make better decisions. We’re not going back to fix things. Our quality of work is better. There’s a new mindset that if it’s not great, it’s not good enough. Now, we hold each other to a level of accountability. Looking at the numbers, we’re pacing to meet our year-end income goal. While consumer loans outstanding declined for almost five years in a row, the first quarter of the year we grew consumer loans by $3 million. This was unbelievable. Managers set more aggressive goals and in the first quarter every branch manager met them. Wow. But the biggest result is the unity within the executive team, the encouragement all around, and a staff believing in themselves, doing the right thing. That’s building member loyalty. Employee turnover was a revolving door in the past, but now that door has slammed shut. WHAT IS STILL YOUR PAIN? There was once a time in my career when I might try to bulldoze over people. I got where I wanted to go, but found that I was alone. Today I care about more than just people’s work. I care about them personally. So now, the most important thing is making the right decisions together when we are faced with a challenge. Staying ahead of the curve like with regulatory changes that are coming along every day, week and month creates a lot of pain. What may be the case today, may not be tomorrow – but our culture will not change. MCT is really walking our talk. But no one outside knows it, yet. And the message has got to get out to the people. If we can get the word out, I can’t believe anyone wouldn’t want to do business with us. 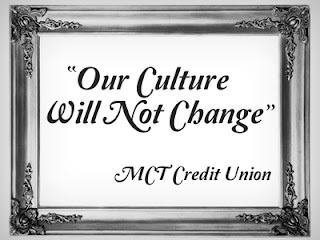 So that was MCT’s story… what’s yours? Is your credit union undergoing a change in leadership? Wondering what next steps to take? Tune in next week for 10 Things to consider during a change in leadership.